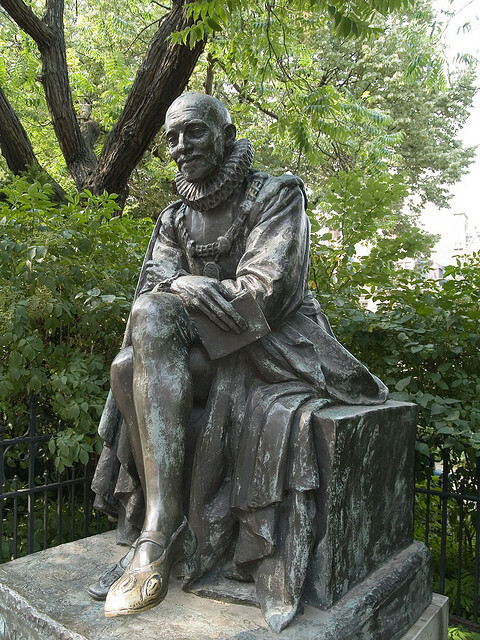 In Bk III, Montaigne’s skepticism is not something he has, an acquisition; it is something that he is, a state of being. Call it, if you will, a nisus (in F. R. Leavis’ sense of that term), a profound, unwilled set of Montaigne’s whole being. Unwilled: for there is no striving in it, no stretching, in particular no self-assertion or desire to exalt himself; it is ripe with a joyful tranquility. It is a nisus toward the total truth. But there is no hurry, no hurry; hurry would slow him down. He fondly and patiently contemplates himself and his life and life. Each essay is a new elucidation of our human being. He writes out of a prodigious lucidity, exhibiting himself to himself (and so exhibiting us to ourselves) across a living width of aspects. Without hands a man might have feet and could still walk: but, consider it, –without morality, intellect were impossible for him; a thoroughly immoral man could not know a thing at all! To know a thing, what we can call knowlng, a man must first love the thing, sympathize with it: that is, be virtuously related to it. If he have not the justice to put down his own selfishness at every turn, the courage to stand by the dangerous-true at every turn, how shall he know? His virtues, all of them, will lie recorded in his knowledge. Socrates’ elenchus targets unacknowledged ignorance; to accept aporia is to be humbled both epistemologically and morally. Is accepting aporia enough to qualify as a skeptic? Well, say what you will. I deem there is no reason to refuse that title to someone who accepts aporia. Notice that, like everything else, accepting aporia has its conditions. Crucially, someone who accepts aporia recognizes that he has bottomed out, bottomed out in knowledge, bottomed out in pride, and is now ready to go on. Aporia ends nothing, except perhaps an episode of conversation; in reality, it is a beginning. Its valence is positive, not negative; the sun is rising, not setting. Aporia marks the moment when we come to see that what we are contending with is a mystery, not a problem. —If this be skepticism, what more can be said about it? It is a skepticism that is turned against worldly wisdom, not a skepticism that is a form of worldly wisdom. By the standards of worldly wisdom, Euthyphro knows and is rightly proud of what he knows. By the standards of worldly wisdom, Callicles knows and is rightly proud of what he knows. Socrates will not judge or be judged by those standards. Kelly, the following remarks are F. Schlegel’s: “Philosophy begins with skepticism…It is characteristic of philosophical skepticism that it concerns itself with the whole man;” “skepticism is the condition of hovering reflection.” Recall that those remarks are voiced by a philosopher who does not only label philosophy “the real homeland of irony” (Socratic irony, no doubt), but also believes that philosophy is shaped by a circle; philosophy’s end is its beginning. Perhaps, then, it is not unseemly to find Romantic overtones in this (in Montaigne’s) form of skepticism? And perhaps, the valence of Romantic skepticism, indeed of Romantic irony, is–in a rather un-Hegelian manner–positive, not negative? I don’t doubt it, but you would know better than I. I hope to add a post soon on irony in Socrates and Montaigne. Perhaps I will be able to say something in it that will provoke you to tell us more about Schlegel and about Romantic irony! Thanks!